Generally speaking, revved up guitars and vocals are found on punk rock albums. But on their wildly careening debut release, the U.K. trio The Mobbs whisk listeners back to the nascent days of The Yardbirds and The Who. It’s . . . The Mobbs is a nonstop party comprised of sonic blasts and rave ups, with an occasional dash of Monty Pythonesque humor adding to the fun. “Pull Yourself Together!! !” finds lead vocalist-guitarist Joe B. Humbled shouting the title in John Cleese fashion over an otherwise instrumental track with an ominous bass line. These guys also go for minimalist lyrics on “Bully!! !” and “Gad . . . It’s The Mobbs!! !” but are capable of stinging satire. The clever “Old Square Eyes,” which is set to a mid-1960s arrangement, warns against the dangers of spending too much time watching TV or playing video games. “You Be The Judge” bristles with youthful rebellion. 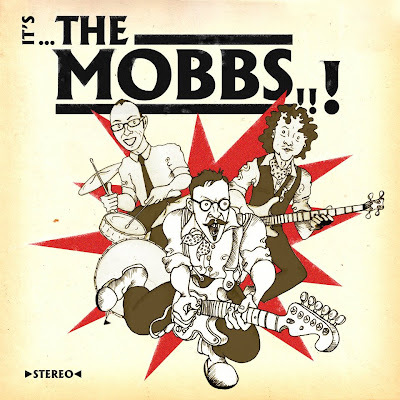 The Mobbs dabble in the blues on the slinky “Better The Devil You Know,” which applies the old adage to relationships, and a funny tribute to cobblers called “The N-Town Odd Shoe Blues.” On the harder rock of “No Belief,” Joe B. Humbled confides, “I’ve got the ravings of a madman” but like everything else on It’s . . . The Mobbs, it’s all in good fun. Wow, thanks for the great review!